Humanitarian crises are devastating: here are five things we can all do to help. This searing image of Omran Daqneesh has reminded many viewers of another Syrian boy, Alan Kurdi, one of the refugees of the Syrian Civil War. The photographer, Mahmoud Raslan, noted that, at the same time, other children were brought into the hospital with life-threatening wounds; one, a little boy who died on a gurney, was named Ibrahim Hadiri. The volunteer who pulled Daqneesh from the rubble reminded the world that such tragedies have been happening in Syria every day. Several photo journalists have been asking how long the effect of this photo will last. Reuters has compiled a harrowing gallery photos of children in Aleppo being rescued from buildings destroyed in the bloody civil war there. We must not forget this photo, for the reason it represents so many other children who are dying in Syria every day. A Wikipedia entry for Omran Daqneesh has been started, but it urgently needs more work, as well as public support. This is a time to remember. Tisha B’Av is also the saddest day of the Jewish calendar, as it was the day of the destruction of both the First and Second Temple. In addition, the Nazis, in their warped ideology, decided it would be a suitable day for the liquidation of the Warsaw Ghetto. This was the time of Korczak’s famous last march, two days after he penned his last diary entry. Shamor v zachor – observe and remember. It’s uniquely Jewish and it’s a mitzvah, a moral duty. Or, as Rabbi Jonathan Sacks said, “Do remember the past, but do not be held captive by it.” Learn from the past; don’t dwell on it, but use it to take the right direction, to do good deeds. With both themes in mind, it is good to reflect on the life of Emmanuel Ringelblum. Like Korczak, Ringelblum had the opportunity to flee the Warsaw Ghetto but saw it was his duty to remain for a purpose. Knowing that an event of historic importance was taking place and fearing that nobody would be around to write it, Ringelblum assembled a staff of historians and witnesses to record what they saw. This information he used for his own journal, to be published as Notes from the Warsaw Ghetto and for an archive. He called his project and group of witnesses “Oyneg Shabes,” normally a term denoting the joy, oneg, of celebrating Shabbat; these priceless documents telling of the suffering of hundreds of thousands he hid in milk containers buried beneath the rubble. The Nazis eventually found and executed Ringelblum but were not successful in silencing the voice of the Warsaw Jews. Historian Samuel Kassov tells of this tragic story in his brilliant, compelling book, Who Will Write Our History? Both books will be reviewed in this space in greater depth. For now, let us take the time to remember those who remembered, history guarding memory to tell history. Notes from the Warsaw Ghetto: The Journal of Emmanuel Ringelblum. First English-language hardcover edition. New York: Macmillan, 1958. Samuel D. Kassow, “Who Will Write Our History? Rediscovering a Hidden Archive from the Warsaw Ghetto.” New York: Vintage, 2007. Nicholas Kristof of the New York Times has written an alarming piece of how Trump’s rhetoric is tearing our social fabric and affecting children in schools. Fortunately, many students – of all backgrounds – have taken the moral courage of standing up to this bigotry, which is more than one could say about some of our elected officials in the GOP. I have watered the flowers, the poor orphanage pants, the pants of the Jewish orphanage. The parched soil breathed with relief. A guard watched me as I worked. Does that peaceful work of mine at six o’clock in the morning annoy him or move him? He stands looking on, his legs wide apart. A cloudy morning. Five thirty. In response, a look of surprise. They are ill, pale, lung-sick smiles. You drank, and plenty, gentleman officers, you relished your drinking – here’s to the blood you’ve shed – and, dancing, you jingled your medals to cheer the infamy to which you were too blind to see. This prayer was carved out of hunger and misery. I am watering the flowers. My bald head in the window. What s splendid target. He has a rifle. Why is he standing and looking on calmly? He has no orders to shoot. And, perhaps, he was a village teacher in civilian life, or a notary, a street sweeper in Leipzig, a waiter in Cologne? Perhaps he doesn’t even know that things are – as they are? He may have arrived only yesterday, from far away…. And the last photo of Janusz Korczak shows a very worn man, but his spirit still shone. And to note: On this day, in 1944, Anne Frank and her family were arrested. Here’s the article from the Anne Frank House. Visitors to Warsaw, Poland, can sign up for a personal guided tour of the places in Warsaw where Dr. Korczak lived and taught. 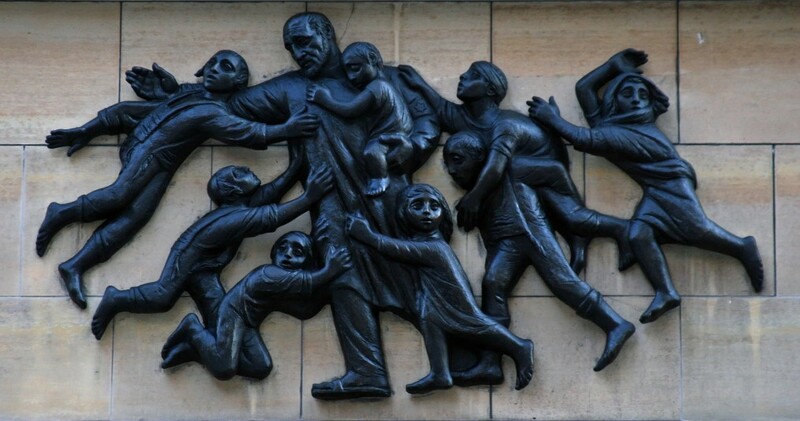 A recent article in the Warsaw Insider traces these places and what they meant in the life of Janusz Korczak.